When something goes wrong, there’s rarely a shortage of blame to go around. Self-protection mode engages and people end up wide eyed and pointing in both directions like The Scarecrow in The Wizard of Oz – and that’s a tame response! There are also people who will happily hop on their soap box and fashion a scarlet letter for every individual who can be charged with the crime. For example, just the other day I bought a bottle of water from a mini-mart at a gas station when the woman making change for me ran out of dollar bills. She had more in the other register – it was no big deal at all, but I got the deep breath, eye roll, slam the drawer shut routine as she explained that the situation was due to her atrocious co-worker, Lauren. I think she was trying to make me feel better because it was going to cost me a full 30 seconds of my day – but the truth is she just seemed unprofessional and drew attention to something I wouldn’t have even noticed. This is just a teensy peek into a big world of blame – but I suspect you’ve just conjured your own memory of a situation similar to the one I described. The funny part about it is that it usually comes from really well-intentioned people! Those who really care what customers think sometimes get nervous about causing disappointment or let-down and they miss the memo about embracing the “we” and instead go straight for the excuses and blame making things worse. Any of these sound familiar? Sorry you had to wait so long, we’re really short staffed – 3 people called in sick today! Sorry we’re out of coffee, the delivery guy is always late on Wednesdays! Sorry we don’t have your hotel room available, my boss always overbooks us and makes me deliver the bad news! 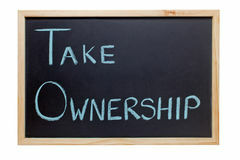 Ownership is a really big concept with a lot of moving parts – this concept happens to be a big one. The more you can do to instill ownership, the less likely this sort of behavior will pop up and degrade your hard work. This is a hard one to train – it’s more of a coaching/culture combination. If your people feel confident about the teamwork, the management, and the processes – you’re off to a good start. From there, be a good example of accepting responsibility – if you make excuses internally, your people will take their cues and do the same with your customers. Employees sometimes forget that to a customer, a disappointment is rarely with an individual, but lies with the organization as a whole. Customer facing people have the honor and chore of accepting the accolades and complaints on behalf of the whole organization – so it’s important to remember the responsibility and ownership piece. What are you doing to encourage ownership instead of blame? ← Can’t Buy Me Loyalty!